At long last, I have found some time to start playing with Arduino stuff! I decided that good starter project would be simple weather station that reads temperature, pressure, … sensors and shows them on an LCD display. Below you will see a first cut using a TMP102 temperature sensor from Texas Instruments mounted on a breakout board from Sparkfun. 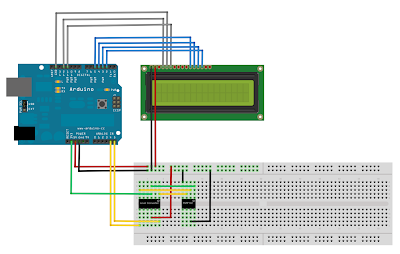 The breadboard mock-up diagram was created using Fritzing. Fritzing is a great tool for documenting breadboard mock-ups and at the same time it can create a schematic diagram and PCB for the setup. It already comes with a few standard parts that can be used out of the box, but also has functionality to add custom parts to the library. Unfortunately, I have not been quite successful with that part yet. The parts require SVG files for breadboard, schematic and PCB footprint and Fritzing does not quite like the SVG I generate using Inkscape. Actually, Fritzing can read my SVGs all right, but when I save the newly created part and reload it, all the text and pin markers are offset. So it is actually Fritzing that is generating SVG files it is not able to read! I will have to investigate further at some later time. The TMP102 is a 3.3V device and so it needs a logic level converter to interface with the Arduino board. Fortunately, there is a level converter that can be used to bridge the interface.